Alex retold the story of his daughter's request, at 4 years old, to help him find Aliens for school. This lead him to the Mornington Peninsula Astronomical Society and with his first look through the the telescope, while not finding aliens, he found a passion for the stars. Very soon after he bought his first telescope, which was quickly replaced by a bigger one, then a bigger one, then a bigger one over the last few years. He has, currently, settled on his latest... a 22 inch mirror-based telescope that has let him see objects up to 1.5 billion light years away. My mind is blown, my hunger for looking closer at the stars is whetted, and I'm sure most of the audience felt the same. Alex next had us stunned by showing us more photos taken with his Nikon D700 and explaining that although these images looked like they have been coloured, they in fact haven't. The colours captured are natural and it is the limitation of human night vision that prevents us from seeing the true colours of the stars, colours that our camera's can capture. 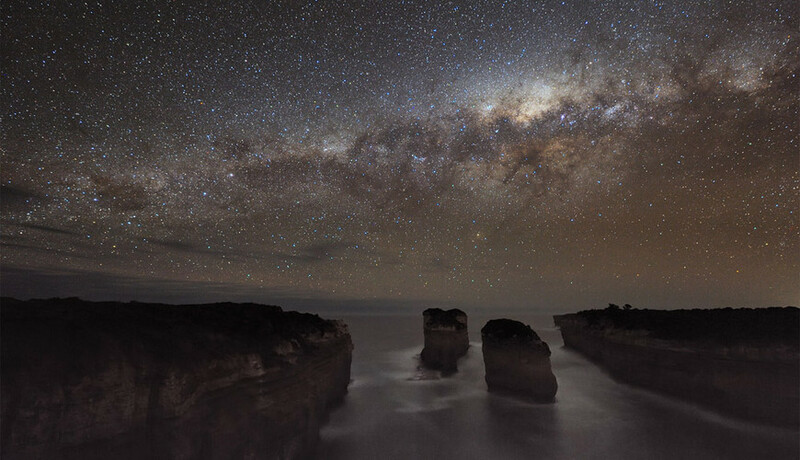 The photography lead to the making of short time lapse videos, one of which, Ocean Sky, shown below, saw Alex awarded overall winner prize at STARMUS astrophotography competition. As a winner, Alex was invited to the STARMUS festival, a week on Canary Islands in 2011 where he was privileged to hang out and rub shoulders with some of the most famous people in the field; including Neil Armstrong, Buzz Aldrin, Brian May, Richard Dawkins, Bill Anders, Kathryn Gray (the youngest person ever to have discovered a supernova) and many other people I couldn't write fast enough to note. Apart from meeting these liminaries, Alex was also awarded with an hour's viewing time using the Gran Telescopio Canaria, the world's largest optical telescope. While the time lapse that won Alex this prestigious award was only 2:41 seconds in length, Ocean Sky, was one and a half years in the making. An amazing and beautiful feast for the eyes and the ears. After enthralling us with his wonderful imagery, Alex laid forth the challenge... we too can make images like his; and we could do it with our own digital SLRs and kit lenses. Open and sharing, Alex went on to detail the steps needed to make stills, composites (for star trails) and time lapses of the night sky. He discussed how to find great locations and how often the foreground was as important as the stars beyond. This one is tricky, there's a rule (more a guide) to make sure you don't end up with star trails and to keep your image as crisp as possible. It's also based on the supposition you're shooting with an aperture around f4. The rule is the maximum exposure time = 600 / effective focal length. Meaning on a Canon 500D with a crop factor of 1.6 the equation would be 600/(15x1.6) = approx 25 seconds. Alex was a wealth of knowledge. Members of the club will benefit from a PDF of Alex's presentation which will hopefully correct any little mistakes I made during note taking. But here's a couple more general rules Alex shared. To shoot the sky in and around Melbourne. Avoid light polution. Travel about 150km from the metropolitan edge or travel south and shoot over the ocean (Mornington Peninsula, Great Ocean Road). Aways shoot in RAW. RAW produces unaltered data in 12-14 bits rather than the 8 bits of a JPG image. Basically meaing you have more information to play with. Don't use noise reduction unless you're taking a long exposure (in minutes) instead use noise reduction of your editing program or something like Noise Ninja or Neat Image. Use a series of shorter exposures, stacked, to make star trails rather than a single super-long exposure. Super long exposures will show up your hot pixels more and they will be harder to deal with in editing. Use free software like startrails.de to stack your images to make star trails. Make sure you have consecutive numbering if you're going to make a time lapse. Find free music to accompany your time lapse at Jamendo or The Audio Archive be aware of the rules of Creative Commons Licensing when using this audio (or any creative common's properties). Watch Alex's time lapses on Vimeo. Alex Cherney would also like people to be more away of the efforts to improve the night sky for all. An amazing number of people from Europe and the big cities in the US have never seen stars in the night sky. The large amount of light pollution has rendered the stars invisible to the naked eye. We're grateful to Alex for sharing his time and knowledge with us at the Williamstown Camera Club. It was a fantastic presentation we all enjoyed.